Stretched like a crescent moon across nearly seven hundred miles of wilderness, The Alaska Range is a formidable wall of mountains separating the south central coast from the interior of Alaska. Due to its remote location and vast scale, very little of it has been properly documented – which is where Carl Battreall comes in. Combining a passion for photography and the mountains, he is currently working on a large-format book about the range, while conducting research in the more remote sections for Project Pressure partner Adventurers and Scientists for Conservation. We caught up with him to chat all things Alaska. Tell us a bit about yourself – where did you grow up and where are you based now? I grew up on the south side of the central Sierra Nevada mountains in California. Both of my parents worked for the Forest Service. I moved to Santa Cruz, California when I was twenty. I worked as a custom Ilfochrome printer, while studying classic, large format, black and white photography with some of the modern masters. In 2001, I moved to Alaska, so I could be near big mountains and glaciers. I am currently living in Anchorage, Alaska with my wife Pam and son Walker. How did the Alaska Range Project get started? The idea came during my wedding in 2003. My wife and I, both being a little obsessed with big mountains, were married on the Ruth Glacier, in March. We then spent ten days climbing and exploring that section of the Alaska Range. One night, while looking at maps, I realised how little of the Alaska Range has been seriously photographed. Outside of Denali National Park, I had seen very few, professional quality images of the Alaska Range, one of the great mountain ranges of North America. I wanted to see and explore those areas that few visit, photograph the nameless glaciers and lonely peaks. When I began researching the Alaska Range, I was surprised that there had never been a photography book, or any book, about the entire Alaska Range, so I knew I needed to do it. What are the main challenges you face shooting in the area? Remoteness. I quickly realised why no one had done a book on the entire Alaska Range. So much of it is difficult to access, and extremely isolated. Once you pierce into the mountains it’s tough going – character building! Bush whacking, swamps, dangerous river crossings, deep snow, big crevasses, bears, bugs… the Alaska Range has it all! It also has a notorious reputation for terrible weather, and I can attest to that. It can be really demoralising to spend tons of money, months of planning and hard physical work to get to an area and then just sit in a tent and not take a single image. I have gotten really depressed on more than a few trips. Have you noticed changes in the landscape since you started the series? Definitely, the glaciers being the most obvious. They are quickly creeping their way back into the mountains. My guide friends and I have also noticed how quickly the “Green Line” is growing in behind the receding glaciers. Places that were pretty easy to access ten years ago are now bush whack nightmares. Are there any specific issues related to glaciers in the region? Well, I think the climbing community is noticing the changes to the glaciers the most. Take the classic route up Denali, it was once an pretty easy walk up, but there is less snow now, more exposed ice, it’s gotten more dangerous, more difficult. In the eastern Alaska Range, some ugly things are being revealed as the glaciers recede. Over the past eighty years, the Delta Mountains have been used for all kinds of military training and testing. There is a lot of cold war trash and waste revealing itself. I heard they dumped some really bad things in the mountains back then and now it’s showing up. What is your favorite memory from the series so far? Every trip into the mountains is special. I don’t take true wilderness for granted, it’s a rarity in the world and I know it. My fondest memories are sharing the wilderness with close friends and family. I also cherish my encounters with the wild creatures that make the mountains their home. I admire their strength, courage and resilience. I also worry about their future. All images © Carl Battreall. 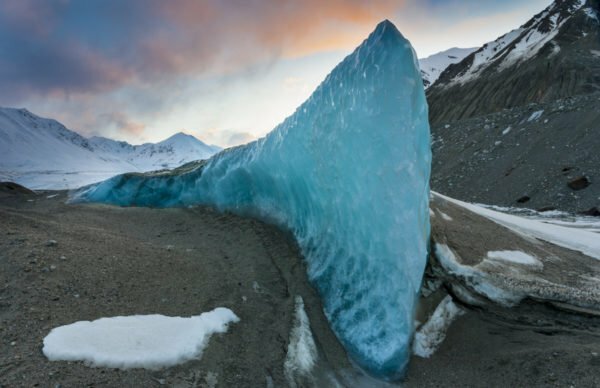 Exposed ice fin, Black Rapids Glacier, Eastern Alaska Range, Alaska. North Face of Thunder Mountain, Denali National Park and Preserve. Caribou below Peak 10190, eastern Alaska Range. Shadow of Mount Church projected into the clouds by the morning sun. Unnamed glacier. Peak 8065 and Mount Redoubt, Neacola Mountains, southern Alaska Range. Mixed light, Hayes Glacier, eastern Alaska Range.